Convert scanned image to Excel. Recognize text from image to Excel. 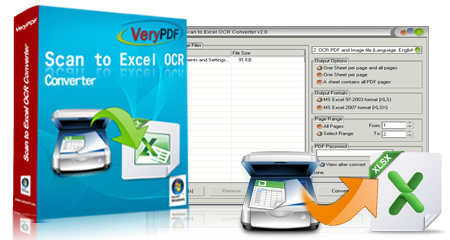 Scan to Excel OCR Converter is a useful tool to convert scanned image to Excel document with the best OCR technology in the market. In this application, two output formats are supported, including MS Excel 97-2003 and MS Excel 2007 formats. At the same time, three output options are allowed to make the layout of newly created Excel document in various styles. Scan to Excel OCR Converter can recognize six kinds of languages perfectly. 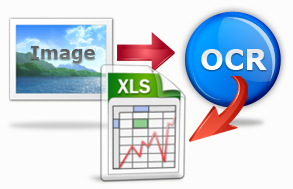 Scan to Excel OCR Converter can be used to convert scanned image to Excel document. It also allows users to save the document with different layouts, including: "One Sheet per page and all pages", "One Sheet per page" and "A sheet contains all PDF files". According to your needs, you can choose any one of them. 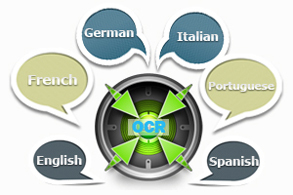 Scan to Excel OCR Converter can recognize six different kinds of languages, including: English, French, German, Italian, Spanish and Portuguese. When you convert image to Excel document, the application can distinguish the language in the image quickly and then extract them to editable characters in new Excel document. 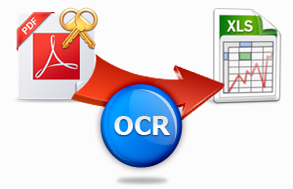 Scan to Excel OCR Converter can convert encrypted PDF to Excel. You can input the user password in the application and choose a layout option. Then the application will convert the encrypted PDF to Excel document for you itself. You can also select page range in the conversion according to your needs. Convert scanned PDF and image files to editable Excel documents in batches. Allow selecting page range of scanned PDF files. Convert text based PDF files to editable Excel documents in batches. Three output options for Excel documents are allowed, including: one Sheet per page and all pages, one sheet per page and a sheet contains all PDF pages. Support to create MS Excel 97-2003 and 2007 documents. Convert encrypted PDF to editable MS Excel documents. Take the best OCR technology in the market to recognize six kinds of languages: English, French, German, Italian, Spanish and Portuguese. Great image scanning and editing application for image processing. Support lots of scanned image files, including: TIFF, JPG, PNG, BMP, TGA, PCX, EMF, and MNG. Recognize text displayed on screen with OCR technology. Users can recognize characters displayed in any application window on the screen and save them to disk. Recognize characters in scanned PDF and images. It supports various languages, input (BMP, GIF, JPEG, PNG, TIFF and PDF) and output formats. Convert scanned image PDF to editable textual file. A server operator can use a script to call this application on his server.